GARLOCK® ONE-UP® pump diaphragms, with proprietary PTFE on the wetted side, are a significant advancement over conventional PTFE diaphragms. Considerably stronger, with greater flex life, they provide a dramatic improvement in service life. Satisfaction guaranteed, or purchase price refunded. Material/Construction: One-piece composite design with a proprietary 100% PTFE on wetted side. 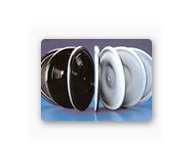 Chemical resistance is the property that makes GARLOCK® ONE-UP® pump diaphragms so versatile. Suitable for use with most chemicals and in elevated temperatures and pressures, these diaphragms are ideally suited for those general service pumps that are likely to be put to one use today and another use tomorrow. You can expect long, effective service life and reduced maintenance costs with these durable one-piece diaphragms. Strength and chemical resistance make ONE-UP® pump diaphragms perfect for most of your pumping requirements. Chemical resistance to all media in pH 0-14 range, except molten alkali metals and elemental fluorine. GARLOCK® ONE-UP® diaphragms may be used in potentially explosive atmospheres when installed in ATEX compliant pumps. For further information, please contact your local Garlock representative.